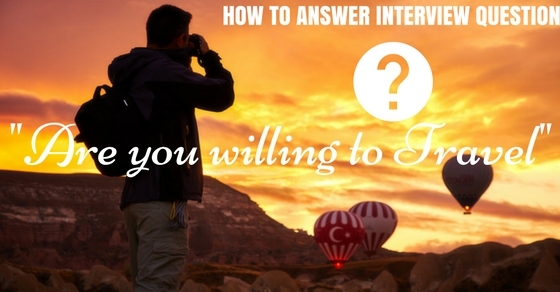 Whenever the question “ Are you willing to travel ” is asked, it is mainly for reasons relating to a job which an employer is offering and asks such a question to see whether the person is willing to travel for the job which may be at a far away location. If the person really wants the job should be a spontaneous and confident enough to show that there isn’t any doubt when answering. So there are certain things that the person needs to keep in mind when they are answering the employer as there shouldn’t be any doubt while telling it to them and some of these points should be kept in mind. The ideal reason when the person is responding to such a question would be for the employer to really understand that the person would like to do their job well enough. No matter when the question is asked regarding travelling for the job, the main aim is that the person should understand that they need to let the employer know that they want to do their job well at all times. Before answering such a question asked by the employer or any person, the individual needs to get all the information regarding it as soon as possible so that the individual can get a better and a broader perspective regarding the job. So get all the information regarding the job before making a final decision and then think about it for a while and submit a final decision to the employer. Before giving a decision to the employer, the person needs to ask them how much time will be spent out when they go on the road as this information is really basic which is to be known by them. The person needs to know how much amount of their work will be spent out in travelling. They also need to know how much time will be taken to travel along with how many nights or days the person will be out on their job on the road away from their home. When the employer asks or tells the individual that they will be travelling for some part, then the person needs to ask the employer for how long will they be away, will it be for a long time which even can go on a permanent basis or will it be for a temporary basis. Will it be for a really long time for a year or for months or will it be for a few days? There is a big difference between the temporary and permanent travelling which the person should know well before giving any final decision. The individual should also find out from the employer that what all expenses might incur during the travel and how much of it will the company pay. The person can ask certain questions whether the person needs to use his own car for travelling, whether will they get any kind of bonus or any overtime when they are in these trips or will all basic necessities such as food, clothing and shelter be covered during this journey for the person. Before deciding whether the individual is ready for travelling they need to know that their spouse along with other family members are okay with the travelling and it shouldn’t disrupt any kind of family harmony and know that the person’s family can afford them to go for this travel. But the person should know that in their absence, their family should continue doing their daily tasks in a proper way and not be too dependable on the individual going on the travel. When the employer asks the person regarding whether or not they are willing to travel for a job they need to talk about it in a positive way so that the employer knows that the individual wants to work. Talking about how travelling has worked in a positive way for them in the past should be told and let them know that travelling has benefited them with respect to their education as well as training in the past, thus making them familiar with different things around them. Talking about how committed the person is with regards to the job they are currently doing really lets the employer know that they really want to do their job well even if it does involve some part of travelling. When such a question is asked about travelling then the person must be committed that they want to work well and let them know that they can rely on them when it comes to the question of job responsibility irrespective of where the job is. One of the benefits that a person or a company gets when they travel on their job is to increase a number of contacts with themselves and the company they are working for. When such a question regarding whether or not the person would want to travel, they need to let their employer know that these kinds of benefits can happen and it will help the company making a number of contacts when they are out travelling. When the question regarding travelling arises, the person should first realize that such a journey may increase opportunity in their life later in the future. So once they realize that they need to let their employer know that they are really willing to work for the company and travel for the job, they should inform it right away without any delay. When the employer asks the person whether or not they are willing to travel, the person shouldn’t start complaining about it to them at the first instant itself. They should first gather all the information regarding the travel opportunity and then give a valid decision and not complain as it can lay a bad impression about them to their employer. They may even assume that the person isn’t really interested in the job opportunity presented to them at this time. In the past it may have happened with the individual that their travel experience did not work out that well with them. They should know that during this time when a new travel opportunity regarding their job is presented to them, they shouldn’t mention any of their previous past bad experiences or any kind of misfortunes which happened before their journey begins. It may lay an impression on the employer that this person cannot be trusted with anything major. Whenever a person speaks about travelling outside the city they are currently living in, even if it is relating to their job, at first in their head things like sight seeing comes up just because they are going out on travelling. So whenever the employer is talking about a travelling journey with respect to business then they must not talk about anything related to sight seeing at all times so that the employer doesn’t think that the person will lack or fail in the job that they have to do. Everyone who is working is mainly for themselves in their everyday life or for their family for supporting them so it is obvious that everyone has family responsibilities to be fulfilled. So they should know that their family doesn’t need them at all times even though they may be out for a while. So the person shouldn’t tell their employer that they have family responsibilities and can’t make it and not give a very long description about it, as you may miss such an opportunity. This basically says that the person shouldn’t let their employer know the percentage or give a number to how much amount of travelling they would like to be doing when they are sent out for travel. They shouldn’t mention any kind of number whether high or low towards how many days they would like to be travelling. If they make such a mistake they may face problems at the moment on their journey or may even have inconveniences later on in their next travelling opportunity. Whenever the person is giving any kind of answer to the employer regarding the answer towards whether or not they are willing to travel they shouldn’t refer towards this travelling opportunity as a burden on their life and at once show negativity towards it. If they do so at once the employer will realize that they are not fit enough for this kind of a job at this moment and may not even be ready later on in the future too and so they need to be aware that they do not respond in this way. Whenever this type of question is asked by the employer whether or not they are willing to travel for the job, the person should remember that they should always answer the question honestly. There is no compulsion in their work life whether they have to go for this travel at this time and if they aren’t ready completely they can be honest and decline the opportunity. When the question arises regarding the willingness of the person to travel, if they have any kind of limitations in their life they need to be clear when they speak to the employer about it. If the person does have to travel on weekends for example then they must let their employer know that they aren’t comfortable with it and will only be able to travel on the weekdays. The person should let the employer know about this initially. Following up to all what has been said by the employer whether or not the person is willing to travel for their job, the person needs to ask a few further questions so that they are clarified with everything and know everything in detail. Asking all sorts of questions gets the person an opportunity to get more information regarding their travel and lets the employer also know that the person is interested in this travel opportunity and lets both of them remain honest enough with each other. When the travel opportunity is being discussed by the employer the person needs to emphasize more on the company rather than thinking about themselves. Certain things like staying in a free hotel room or getting a chance to travel in new places should be over shadowed and the benefits of the job and company should be focused on. So the most important thing when such a question or something similar to this would be for both the employer and the employee is to be honest with one another. Both of them should put the company ahead of themselves individually and should see in what way they can improve in doing the job and see growth within them taking advantage of such an opportunity presented to them.